Francis Joyon sailing the 90ft trimaran IDEC crossed the finish line after nearly 74 days at sea. The French multihull sailor Francis Joyon completed one of the greatest single-handed voyages in history today when he crossed the finish line of his round-the-world record-breaking voyage off Brest just before dawn. It had taken Joyon in his 90ft trimaran, IDEC, just 72 days, 22 hours, 54 minutes and 22 seconds, to complete a voyage of some 27,150 miles, giving him an incredible average speed around the globe of 15.50 knots. Joyon has thus not just broken the old 93-day solo record held by his fellow countryman, Michel Desjoyeaux but comprehensively smashed it, taking more than 20 days off Desjoyeaux’s time. As for the solo multihull record, Joyon has broken that by an improbable 53 days. So rough were the conditions off Brest when Joyon finished that we did not catch sight of IDEC until the huge red and white tri was already in the main harbour, gliding along under a triple-reefed main and storm jib in the half-light. 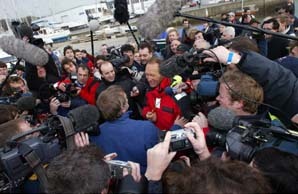 Joyon’s shore team and his wife and two young children were quickly aboard to welcome the Breton skipper. 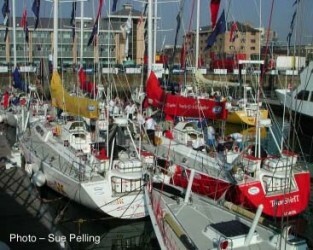 The boat looked remarkably tidy considering both her age and the punishing ordeal her skipper has put her through. It was impossible to see the hole in the port float which resulted from a collision with debris in the water more than a week ago south of the Canaries but IDEC did have a pronounced tilt to that side as she motored in. champagne but it took him some minutes to open it for the obligatory spray around, after he managed to snap the cork off – one of the few things that has gone wrong during this whole extraordinary trip. Joyon has far exceeded what had been thought possible for a lone sailor on the global course. His record time is not only faster than ENZA’s 1994-95 fully-crewed record but only just outside IDEC’s fully-crewed mark of 71 days set in 1997, a time which stood until it was finally broken by Orange in 2002. Ellen MacArthur and others not withstanding, Joyon looks as though he is going to be the holder for this particular record for a long time to come.